Headed to the football Hall of Fame? Here’s the Eagles’ Super Bowl stuff on display. 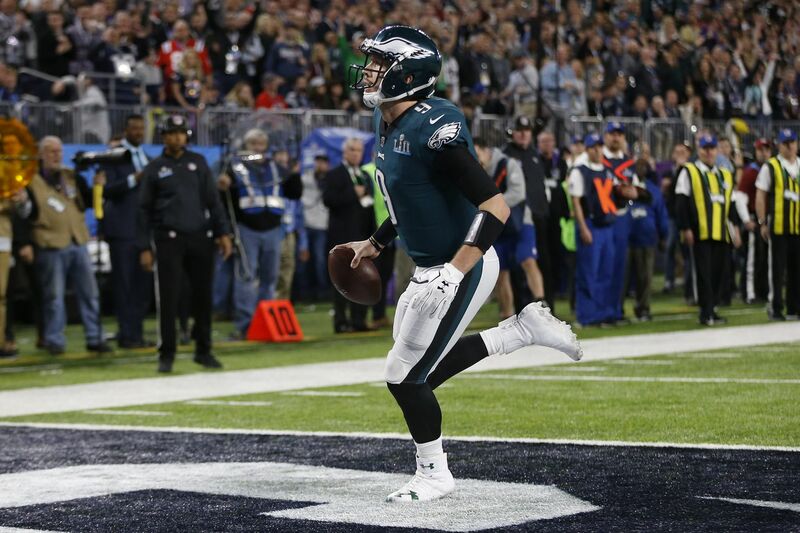 Nick Foles runs untouched into the endzone on the "Philly Special" play during the Eagles' Super Bowl win over the Patriots. Eagles great Brian Dawkins will be inducted into the Pro Football Hall of Fame this weekend. If you're making the trip to Canton, Ohio, to celebrate along with him and the other inductees (except for Terrell Owens), you'll be able to see some special Eagles artifacts from the team's Super Bowl LII win. In addition to the game-worn gear, you could also see in detail the championship ring players received. In case you forgot, the ring — with its 219 diamonds and 17 green sapphires — has a lot of symbolism: the Eagles logo is made of 52 diamonds (to represent the win in Super Bowl LII), and the bezel of the ring features 127 diamonds (the sum of the jersey numbers of Corey Clement, Trey Burton and Foles, the three players at the core of the "Philly Special"). Not heading to Ohio? Saturday's ceremony will begin at 7 p.m. and you can watch on the NFL Network and on ESPN.